As the first week of Ravelympics mania has us all glued to our hooks and yarn, the projects have slowed down a little in the group. If you are like me you whipped out a few quickies, and then settled into the long distance projects! This car blanket by CLF Flaming Hooks member camelvineyard is so lovely! A great way to stash bust! Well done! Hook on peeps…Can’t wait for more FO’s to post about! I don’t know about you, but I’ve been a little distracted by all the exciting things happening on my television set! I was crocheting alone, and then the Mogul competition got going and I forgot to keep crocheting and lost what row I was on…Thank heaven’s my big project for the design a published pattern is a pretty easy to remember stitch repetition for the base of it! So, far I am not the only Team Flaming Hooks member to face an injury, after the attack on my finger, fellow team mate and all star crocheter, Crochetexaminer, had the wind come out of no where and slam a door on her finger…I tell ya, it’s a conspiracy…Of what? By whom? Who knows…All jokes aside, it’s so much fun to do this, it’s exciting to crochet for the stretch of it, stretching our skills, our speed, our talents, our knowledge base, that’s the best part! With over 50 projects listed on our Team Flaming Hooks group projects page, most of them finished, this appears it will be an active games! 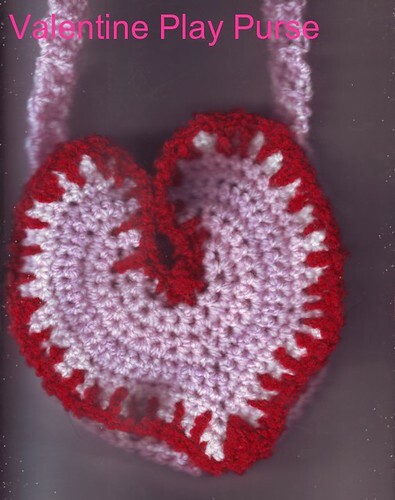 I will be featuring these throughout the week…For now, I’ll feature the one I made impromptu yesturday for my neice, Wonder Princess Gwen…A heart shaped pocket purse (that came with some yummy bon bons)…Just in time for Ravelympics and Valentine’s Day! WHOOT! At 6pm Pacific Standard Time the Ravelympics kicked off! Team Flaming Hooks, the official team of the Crochet Liberation Front, started the games in fine form. Balls were wound, hooks polished and at the ready. The team had limbered up with stretching exercises and yes, those fabulous finger exercises that really wiggle and loosen you up! This team member, Fearless Leader, has begun the games with an injured index finger. That’s right, Thursday evening while cooking dinner a can lid jumped out an attacked my finger. So, far it doesn’t look like it will impair my abilities in competing! So, far I have completed a child’s neck warmer, and am working on a valentine’s day themed scarf for my daughter, I have the stitch pattern worked up and the wrap I am designing for the pattern writing event ready to go, and today I will be out with hubby all day driving from book store to book store, so should get a fair amount completed on that drive. 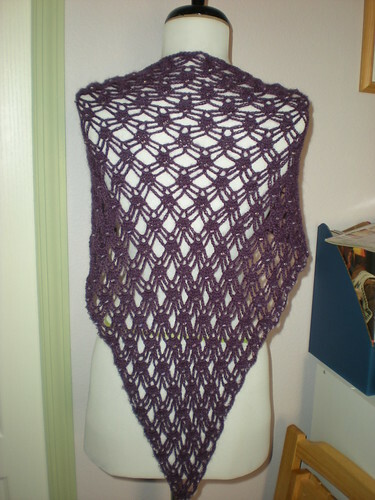 I am hoping to complete the It’s a Wrap and pattern in a few days. It’s a simple stitch pattern, just working on the dimensions, but as with all things simple, ever mistake can show, so working on keeping up the polish. Also in the works, a vest to go with the cutest blouse I bought the other day…Isn’t that why we buy clothes? Don’t forget that you can root for our team, we need cheers and cheerleaders for the CLF!! Hook on my friends! Hook on! The yarn world’s answer to real competition, the Ravelympics start this Friday to celebrate the Winter Olympics in Vancouver. This is the second Ravelympics, for those of us who love watching them and for those who don’t, an excuse to play with yarn is always grand! This time around the CLF has a team, The CLF Flaming Hooks!! Notice how cool our badges are! I just bought a wonderful cotton yarn to make a lace wrap for spring, and I’m going to try to have that as my designed and published piece! To see the rules and events check it out on Ravelry.com, and enjoy! Everything kicks off 6pm PST on Friday, Feb 13! Stay posted for more information and pics of Fearless Leader’s and other CLF member’s entries! Ravelympics Team: The Flaming Hooks. Today is the last day to vote on the CLF’s team for the “Ravelympics” button and banner! Go vote for your favorite HERE! We have 71 folks in the group and let’s have some more! Let’s smoke them all with crocheted brilliance. There are so many events to choose from!!! I’m inspired, and have plans…yes, plans…be wary..oh yes, plans. I digress, we can use more people to sign up! And I give huge thanks to CLF members, arielart and tena for their hard work setting up the team, and moderating the forum! Thank you so much guys! !